Occasionally, we may feel like happiness, health, love or success is out of reach. In such moments we can use some timely wisdom or inspiration to get through the challenge at hand. If a good friend is not available during these times, "Notes to Self: Inspirational Wisdom for Daily Living" can be a real bonanza! This e-book is packed with 365 unique gems--reminders to motivate readers to live a more authentic life, in the here-and-now, changing the way they look at the world so that they can transcend most any situation by seeing it as the gift that it is. For a quick piece of advice, use this e-book as an oracle by randomly going to a note and then pondering on how it applies to your current situation. Loaded on an e-book reading device lying on a coffee table, it is liable to transform the life of any unsuspecting reader who happens to pick it up! 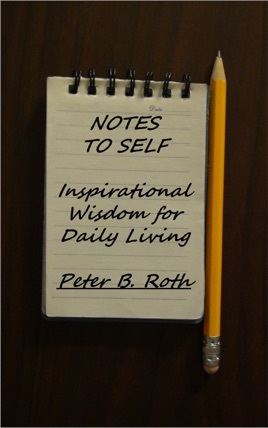 Preempt any crisis by reading the e-book cover to cover, one note per day, as a daily thought upon which to meditate. Use it for discussion topics. In any context, this book is a helpful and valuable tool for anyone interested in personal growth and living a better life.